Never! Never ever! Never in a million years! Never, you hear?!…NEVER! Ok, just this once. 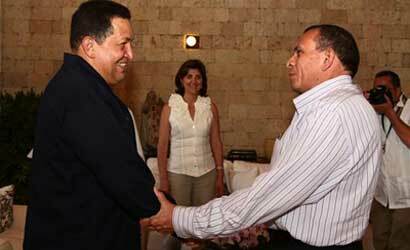 Newsflash: Hugo Chávez vows never to recognize any government in Honduras Libya other than Zelaya’s Gaddafi’s. The pathos, the isolation, the sheer ranting lunacy is really reaching a very worrying level here. It fazes the guy not at all to be the only ally Gaddafi has left anywhere in the world. Evo won’t go there. The Castro Brothers won’t go there. None of the 4th world African leaders Gaddafi has spent four decades cultivating, donating money to and generally bankrolling will go there. No Arab leader will go there. No muslim leader will go there. Not even the Bahraini royal family will go there. But Hugo’s there. With bells on.